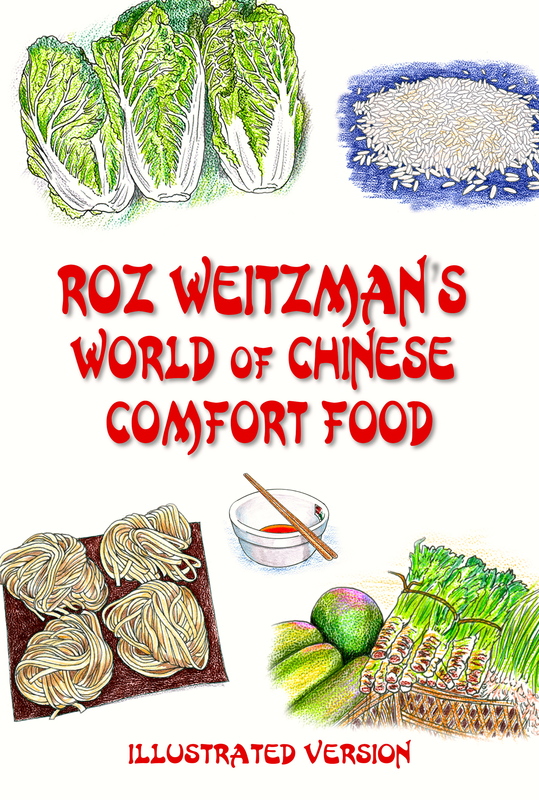 I am thrilled that my ebook, pdf and soft cover editions of “Roz Weitzman’s World of Yunnan Cuisine” are finished and ready to share with you on my newly launched website http://www.rozweitzmansworld.com! It’s been such a fun (and tasty too) recipe writing, cooking, photographing, illustrating and getting ‘Chinese’-creative in the kitchen! There any many, many cookbooks out there. So what sets “Roz Weitzman’s World of Yunnan Cuisine”apart? No hard-to-find ingredients – everyone has the access and budget! No difficult techniques – Yunnan food isn’t tough to make! Short prep and cook time – people are busy! Most recipes take 30 minutes or less to make. No fancy equipment – all you need is a wok pan, a pot, a wok spatula and a cleaver. Single/four-serving – but easily scalable to feed more or less! No more boring Chinese Stir Fry! Available in softcover, epub, mobi, and pdf! Let me prove to you that ANYONE can cook mind-blowingly delicious and simple Yunnan Cuisine with accessible ingredients. If you are a beginner: this is the perfect book for you. I will guide you, step by step, from grocery shopping –> prep –> creating inspiring food. If you are an experienced cook: this is also the perfect book for you. Use my recipes, traditional Yunnan flavors, and methods as inspiration to build upon! Order this book online , directly from Roz if you’re in China through a Chinese bank transfer or I’ll send to you in mid-July when I’ll be bringing copies to Toronto. Feel free to forward this email to someone who likes cookbooks. Every country throughout the world has their own typical or cultural bread. China is no exception with their mantou and baozi, which are rolls of dough steamed in stacked covered bamboo or (now) metal baskets at boiling temperature, sometimes being stuffed with meats or vegetable combinations. But perhaps a fairly unknown but interesting, tasty and most-like Western bread is Guandu Baba. 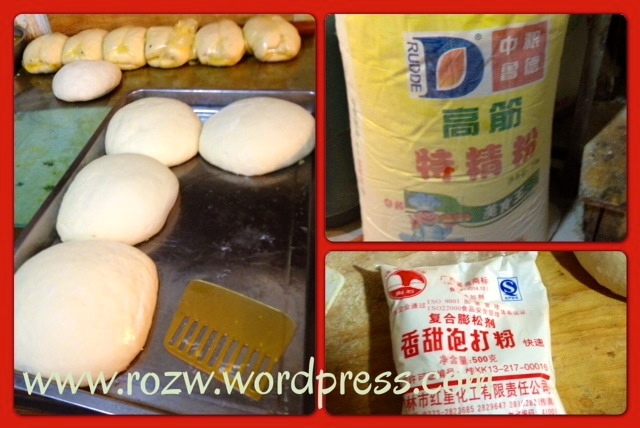 Baba is a yeast bread, made in my local neighbourhood market near Guandu Ancient Town in a 40 meter square bake shop. But it’s not your traditional Western loaf, cut into slices, but a 10-15 centimetre round, so delicious with a wonderful texture like some Western breads. Since finding Baba, the baking couple have become my friends, sharing our creations in bread making and our little secrets (even though the language barrier is great, we still enjoy our short conversations). When I asked to watch them and know more about this bread process, they obliged. 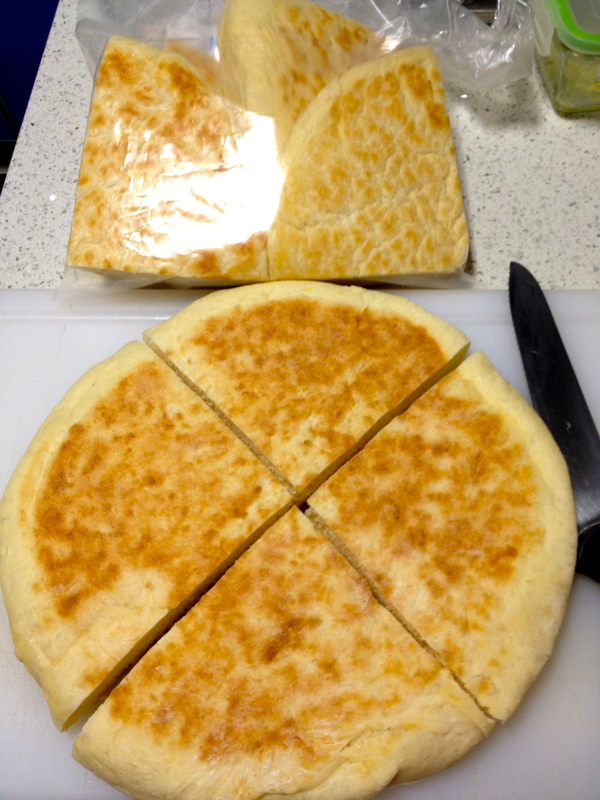 I have used Guandu Baba for making salty and fruit pizzas as well as my main breakfast food – cut into quarters, sliced in half through the middle, toasted in my small oven, and eaten with butter or jam or cream cheese. At this point I’d bet it’s even delicious with peanut butter. No matter where you live in the world, if you’re a bread maker, your work starts way before your customers get their hankering for a slice of your bread or toast, and usually even before the sun comes up. My bakers, who come from DongBei in northern China, are no different. Mr. Wang Jing Zhang and Mrs. Bi Yi Min start their loaves rising at 6am and continue to bake and serve their customers until the last of their daily supply is sold – that’s usually 8pm. You could say that bread making is not an easy life. But it’s a rewarding one – as “bakers feed the world”. It’s said that Westerners eat bread and Chinese eat rice. Of course there is much truth to that in general, however Westerners eat bread more often in loaves, whereas Chinese have just as many varieties of bread products to choose from. What starts off as basic dough, but by changing the shape or changing from wheat to rice flour, produces a huge variety of foods by mixing in or sprinkling on some spices, more or less salt or sugar, other ingredients, such as eggs, or vegetables, or adding or subtracting oil. (I like to call them) my bakers use one small grill-type round ‘oven’ for their many varieties of bread-type foods. Interesting enough, the temperature of 150C was used for all products, only shortening or lengthening the cooking/baking time…all done without a timer, amazingly! The baba dough consists of plain wheat flour, water, yeast and a very tiny amount of MSG. When saying this she puts her thumb and finger together to suggest a pinch! The dough is mixed and shaped into larger than fist sized discs and set aside in their warm, small shop to rise on baking sheets until about doubled in size. The baking procedure is simple. Three babas at a time are placed on bottom of the ‘oven’ – a very lightly greased surface – and using the hand, are flattened. Then the lid of the ‘oven’ is closed. The babas bake on one side for 5 minutes, then are turned with wooden tongs and cooked on the other side for another 2 minutes with the lid closed again. After much discussion about the correct name for this oven, it’s been determined that the oven is called a “Bing Cheng 饼铛”. Voila, fresh, hot, wonderful smelling Guandu Baba! This dough is also used to make the large flat pancakes with a heavy, long rolling pin, in two flavours. More oil is added and the first pancakes come out of the oven quickly, then are sprinkled with sesame seeds on top, cut into small bits and put into a small plastic bag with a toothpick from snacking as you walk along doing your errands. There’s a lovely, crispy sesame taste to these. The same pancake is morphed into a spicier snack, with a mixture of chilli sauce, sprinkled with green onion on the top. The dough that’s wrapped in clear plastic is the original recipe with some oil and eggs added into the dough, and following the same procedure as above, is cooked in more oil and done very quickly. The morning I was there, they had already made over 30 babas, many other kinds of bread products, and nice warm soya bean milk. And that was at 9:00 in the morning. During the mid day they will make another batch or two of dough and continue to bake more breads throughout the day, keeping their booth stocked with the tasty morsels that the customers have grown to love over the 6 years they have been in Kunming. I am wondering if they’re going to expand or sell their business. Just last week, they had a woman and her son working together and the baker seemed to be teaching his sister-in-law and nephew how to do what he and his wife have been doing for so long…baking baba and traditional street snacks. It’s quite normal that with two more pairs of hands in the back, their business will improve, just as long as they don’t move or close down that will be fine…that would be a pity for all of the residents of my neighbourhood but mostly for me! My hats off to this talented couple who, like so many others in the same shoes all over China, work incredibly long hours in cramped quarters with recipes passed down from generations using simple utensils and equipment to feed the masses with ever tasty and predicable breads! I’m so proud to announce the beautiful illustrated version of my latest cookbook, Roz Weitzman’s World of Chinese Comfort Food. Every recipe photo has been wonderfully hand-drawn and illustrated by my talented Illustrator, Nancy Szostak. All the same book of 70 Chinese Comfort Food recipes but with illustrations instead of photos. Please take a moment to have a look at the ebook at the Lulu website and even write a brief review. 10 Yunnan Recipes on GoKunming.com! Check them out! Since I live in China, you might wonder what I eat everyday. My meals have changed a lot over the 8 years I’ve been here. Since I learned how to cook Chinese, my meals have gotten more healthy and more consistently Chinese. Well my breakfast resists the change. I can’t tolerate noodles cooked in spicy sauce, or garlicy food in the morning. I guess that’s a habit I’m not likely to break any time in the near future. It consists of a mug or two of decaffeinated coffee, sometimes it’s instant and sometimes it’s perked, along with a toasted home made roll or quarter of GuanDu BaBa cut in half through the centre, and spread with New Zealand butter. Often I eat it plain; periodically I top the toast with jam, most often Carrefour-brand blueberry or raspberry jam. Sometimes it’s topped with mozarella or cheddar cheese and melted in my ‘easy-bake’ oven. I call it my easy-bake because ovens are not usually built in here…most often if you want an oven you buy a small, tabletop oven which is a little larger than a toaster oven with a higher baking temperature too. In addition to wanting a healthier diet, I live in a third-tier city, not very foreign-food friendly. So after buying pasta in a variety of shapes, there’s not much else. Fortunately dairy products have become a bigger part of the Chinese diet, so butter, and cheeses are available in small quantities, even in this city. Lunches and dinners are almost always Chinese food. Noodles, soups, and vegetables of all kinds, and served cooked and fresh are a daily part of my diet. Some dish with a small portion of meat for lunch, and vegetables, usually fresh for dinner. Tonight I switched things around and had a cucumber salad for lunch and cooked this stir-fry for dinner. I love this combination in noodles and ofter change the main veggie for something different….broccoli, Chinese cabbage, usually a green one. And I change the noodles too…Udon, rice, wheat, sweet potato or vermicelli noodles; sometimes fresh, sometimes dried. The secret to a good stir-fry is in cutting all ingredients very thin so that they cook quickly, and using a hot wok, keeping it all moving fast so as not to burn the dish! A gas stove helps to control the heat very finely and that can also aid in cooking without burning or making the ingredients soggy. 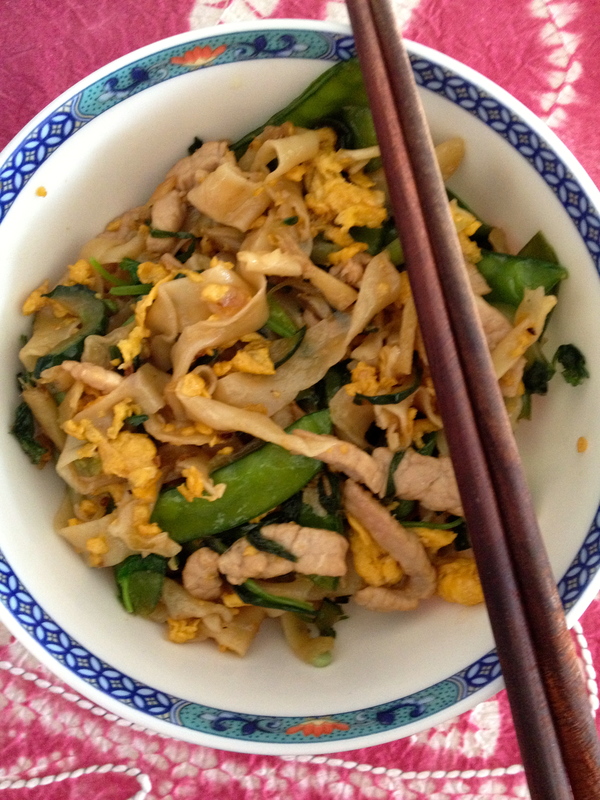 So here you have it, my dinner tonight…Noodle Stir-Fry with Snow Peas and Meat. This dish gets it’s awesome flavours from the traditional mix of ginger, garlic, green onion, Chinese Rice Cooking Wine, and soy sauce. Try it for dinner and I hope you will enjoy! 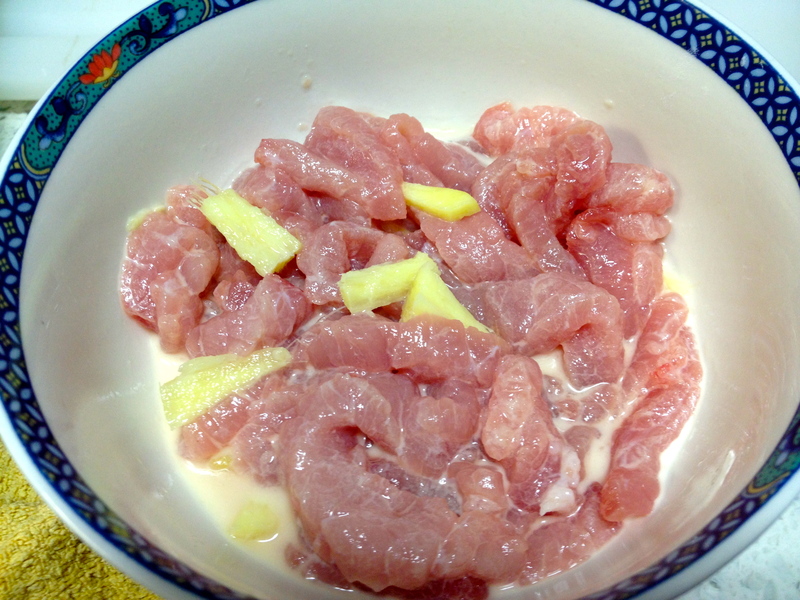 Mix the finely shredded meat with rice wine, half of the garlic and ginger, and the cornstarch and allow the mixture to marinate for 15 minutes. Heat the wok, add 2 tablespoons oil, and wait for it to heat. Stir-fry the eggs and break into small bits. Set them aside. Heat the wok, add remaining 2 tablespoons oil, and wait for it to heat. Stir-fry the chicken or pork with the sauce. Add 2 tablespoons of soy sauce. Remove and set aside together with the eggs. Clean and dry the wok. Then heat the wok, add 2 tablespoons oil, and wait for it to heat. Stir-fry the green onion and the remaining ginger and garlic to release their fragrance. Add the snow peas and cucumber with bouillon granules, and 2 tablespoons soy sauce until brightly coloured and still crunchy. Stir in noodles and heat for another 1-2 minutes on low heat. Add more soy sauce to taste and the fresh chopped cilantro. Mix the ingredients together thoroughly while keeping the heat on low for another minute. Transfer to a platter and serve hot. In the FuXian Lake district near Kunming, there are many resorts popping up all on this deep, freshwater lake. It’s a summer resort destination for many tourists from the province as well as around China. The restaurants around the lake serve visitors delicious traditional delicacies native to the area. The most popular dishes are Copper Pot Fish and Copper Pot Rice. The popularity of their food arises from the use of simple, local ingredients (the fish come from the lake and Xuan Wei Ham is locally produced in Yunnan by salting and drying pork legs). Xuan Wei Ham is used in this recipe and is reputed as one of the most famous hams in China; it’s a rich and tender pork, with a lovely aroma, a beautiful appearance and a delicious taste. Although produced in Yunnan since the mid-1700’s, the history of its popularity goes back 1909 when an entrepreneur in Xuan Wei City in the north-east of Yunnan Province to production into the ham-processing business to make this salt-cured and air or smoke-dried ham. Xuan Wei Ham has been a sought after food product and delicacy ever since it made it’s debut at the Panama-California Exposition from 1915 to 1917. This exposition was held in Balboa Park, San Diego, USA to celebrate the opening of the Panama Canal. This dish gets its wonderful flavour from the Xuan Wei Ham. You can find deceivingly small copper pot at a Kitchen Market at Da Shang Hui for around 220rmb. Mine is the smallest size and a cute little pot that would be triple or quadruple the price were it bought in North America. Using the proportions here, the finished dish just barely covered the bottom of the pot but nonetheless produced a scrumptious combination, reminiscent of my holiday at FuXian Lake and worth every penny – er…rmb! 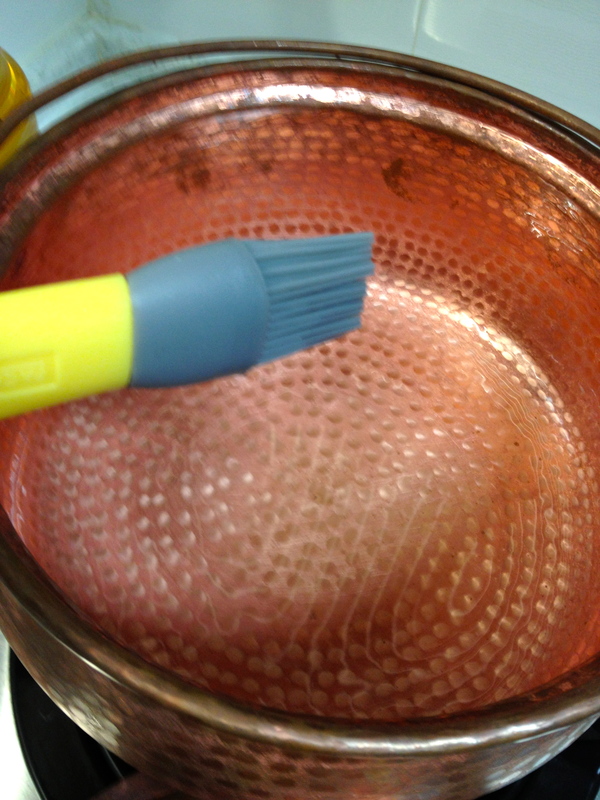 Coat the copper pot inner wall with 1 tablespoon of oil. Soak the rice in 2 cups of water for two hours. Drain the water and place the rice in the copper pot. Heat a wok. Add 2 tablespoons of oil and heat over medium high temperature. 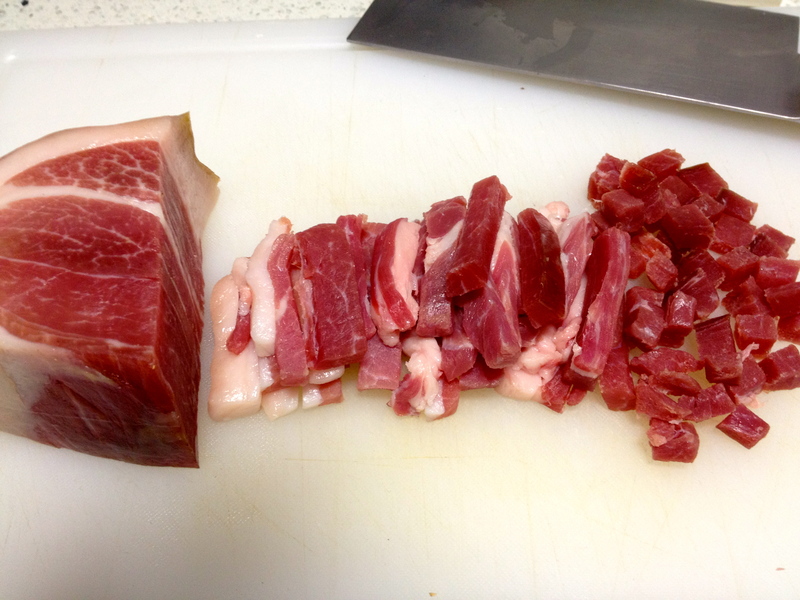 Fry the Xuan Wei Ham cubes in the oil until they are crispy and browned around the edges and have a pale-coloured, cooked appearance. 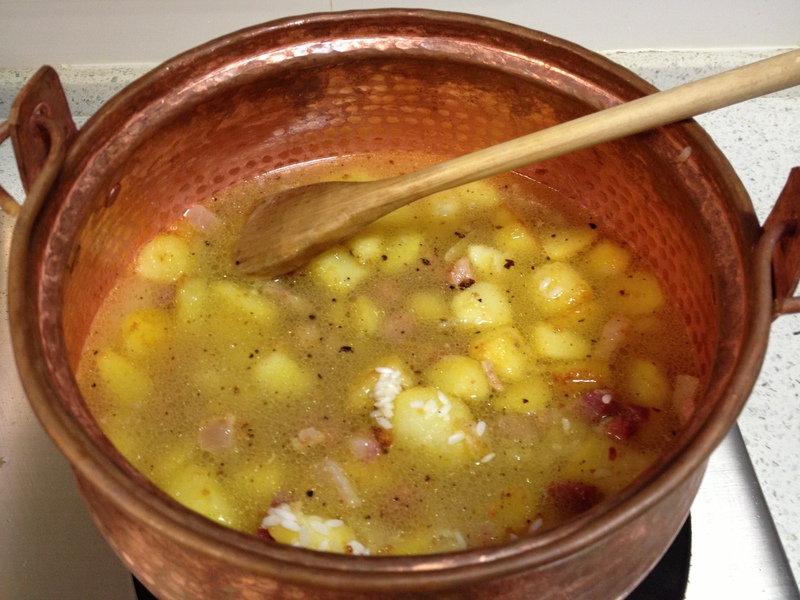 Remove the ham with a slotted spoon and put the cubes into the copper pot, leaving the oil in the wok. Add the remaining oil to the wok and heat to very hot. Dry the potato chunks with paper towel and then carefully add them to the oil to prevent oil splatter, frying and turning frequently until the potato chunks are cooked on the inside and golden brown and crispy on the outside, which will take about 10 minutes. You may need to add more oil. 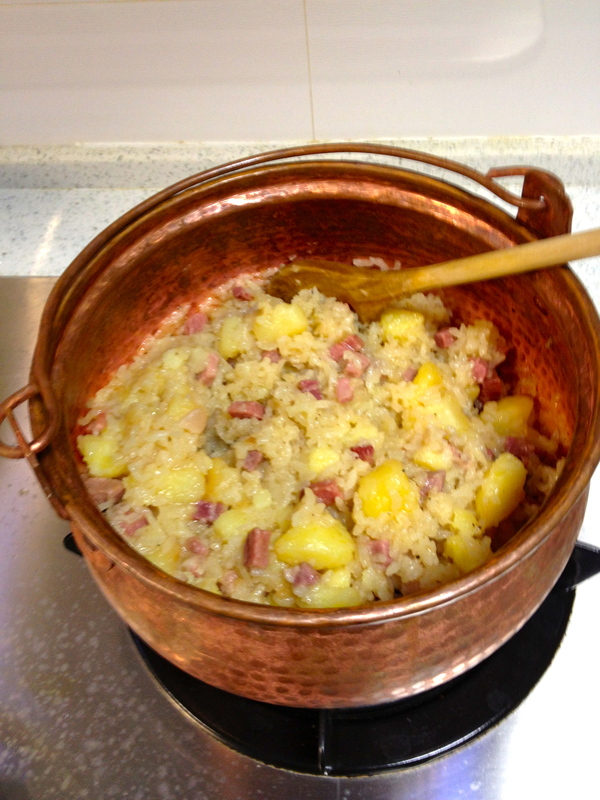 Put the potatoes in the pot together with the rice and ham and stir, adding 2 cups of water. Cover the pot and bring the mixture to a boil on a high fire. Once the water is boiling, give the ingredients one stir and turn the heat to low. Then cover and simmer for 20-30 minutes or until the rice is cooked. Check the rice at 10-minute intervals and add more water if necessary. 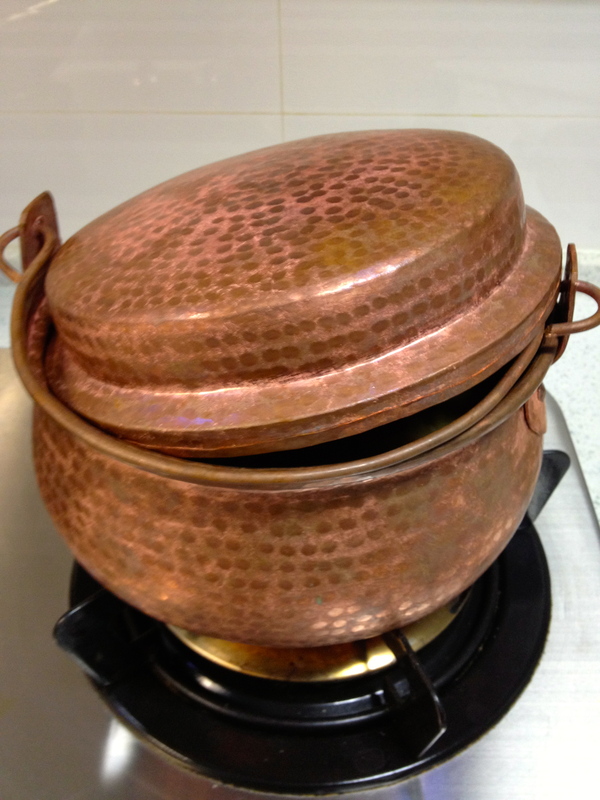 Remove from the heat, place the pot on a trivet on the table and your delicious copper pot rice is ready to serve straight from the copper pot. Enjoy! 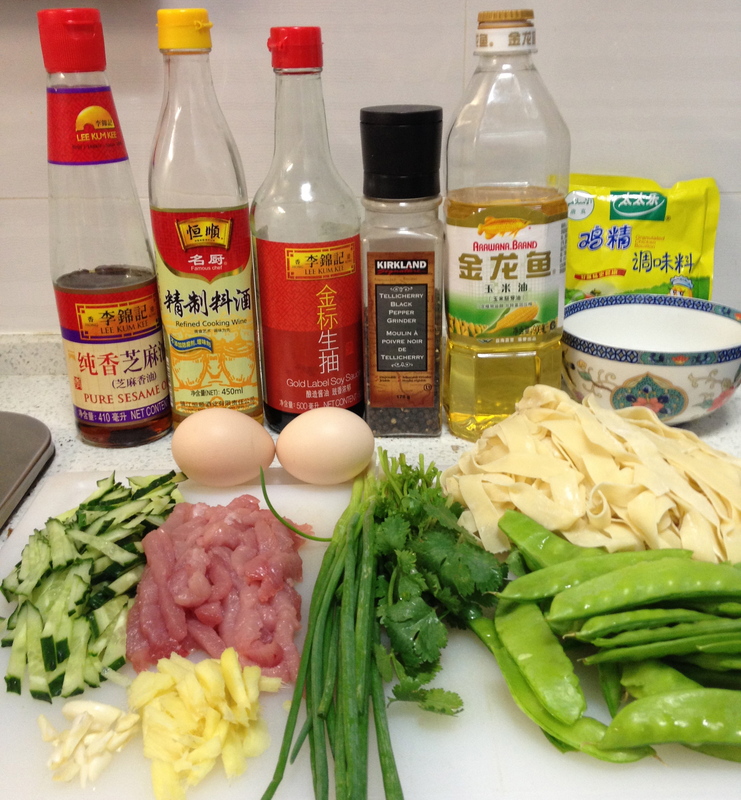 7 Yunnan Recipes on GoKunming – Check them out!